When does unsubtly become too unsubtle? That’s the question I kept asking myself during BlacKkKlansman. Sometimes (especially with the issue of racism), it’s better to be bludgeoned to death with a message than to have it lingering in the background. But there are parts of BlacKkKlansman that were too much, even for a simple bloke like me. That’s pretty much how I felt about the film as a whole. 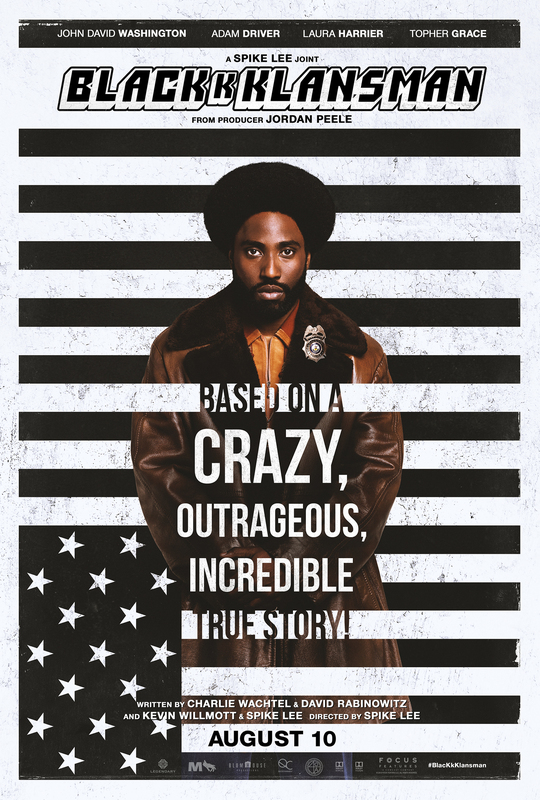 True stories often make odd bedfellows with films, and Spike Lee’s interpretation of the true story behind BlacKkKlansman is one of those odd bedfellows.You wouldn’t Adam and Eve it, would you? 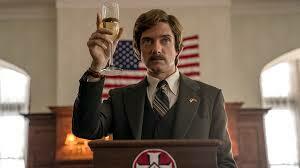 A true story about a black cop infiltrating the Ku Klux Klan in the mid-70s? Well, it’s true. Rob Stallworth, a black cop in Colorado Springs Police Department, did just that. He phoned up the Colorado Springs chapter of the KKK, put on a white man’s voice, and to cut a long story short, became a member of the KKK! Before you stop to think about how a black man received a KKK membership, let me tell you that Rob Stallworth didn’t do it alone. He needed the help of Kylo Ren to be the white face of Rob Stallworth. Sorry, I meant Flip Zimmerman, a Jewish cop who faces prejudices of his own (well, he doesn’t, but that’s not the point). Denzel Washington Jr and Kylo Ren, together at last! That’s the story, essentially. Of course, there’s a romance between Rob Stallworth and Colorado Black Student Union President, Patrice. Rob and Patrice clash over how to combat racism. He wants to use the system to fight racism, but she thinks the system is part of the problem (this is a promising subplot that isn’t resolved). There are also KKK terrorist plots. All of these lead to a convoluted yet fairly entertaining finale, but I couldn’t help but shrug my shoulders when the credits rolled. I think I can pinpoint when BlacKkKlansman peaked, and it’s a point at the very start. Rob, as his first assignment as an undercover cop, is asked to attend a talk at the Colorado Black Student Union by former Black Panther leader Stokely Carmichael. His speech is utterly enthralling, a speech to make you stand up and cheer. I’m sure that if the actor behind Carmichael, Corey Hawkins, showed this much passion as Jack Bauer’s successor in 24: Legacy, he’d still be playing Bauer’s successor as we speak. Yes, the speech is a sledgehammer to the skull, but that’s what we needed. However, the film strains itself to draw parallels to the modern world when it doesn’t need to strain. It’s not a hard thing to do. But when you have one cop saying to Stallworth that the KKK’s tactics in the 1970s will lead to someone like David Duke being elected in the future, any semblance of subtlety is lost. Stallworth doesn’t believe people would be stupid enough to allow that to happen. But of course, we the people in 2018 know that Donald Trump is in the White House. I felt that sledgehammer almost bludgeon me into a coma. Forget about Tom Hardy, this is my Venom! There’s ostensible difference and conflict between, say, Stallworth and Patrice about how to combat racism, but it feels like an attempt to add complexity to a film that lacks much complexity. Do any of the members of the KKK presented in the film resemble anything more than caricatures? No, no they do not. Now I’m not saying present more sympathetic racists. I’m saying present racist characters that we can rally against. Here, they are ignorant idiots, bumbling from one scene to the next. Yes, they provide a little laughter, but does laughter combat racism? A lot of people laughed at the idea of Trump becoming President, but yet here we the people are in 2018. Laughter is sometimes the best medicine, but this film can’t rely on laughter alone. Instead it relies on strong performances and unsubtle references to the world we live in. But it’s a film that outstays its welcome. Halfway through BlacKkKlansman, I realised I was bored. Trimmed by half an hour, BlacKkKlansman could have more than simple entertainment. But conversations are dragged out to a Tarantino-esque degree. When the final bookend hit before the credits, showing footage of the white nationalist march in Charlottesville, Carolina in 2017, I couldn’t help but roll my eyes. I knew what was coming next. Trump’s speech about both sides having bad people/some racists being good people. Was this bookend necessary? I think most white liberals, or anyone with two brain cells to rub together, could connect the dots between the film and today’s troubles. I allow for absolute unsubtlety if the media I am consuming is entertaining. 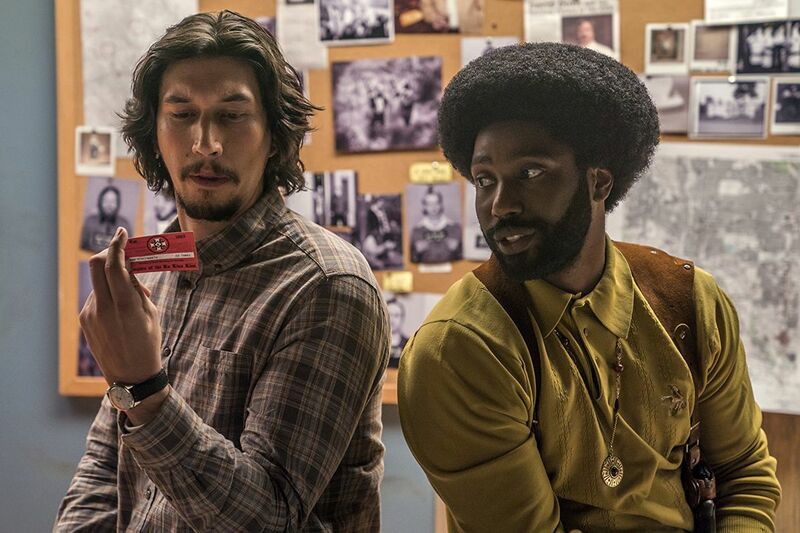 BlacKkKlansman seemed to slow to a stop at various points, halting the narrative to mock Trump. I’m all for mocking Trump. But it’s not hard, is it? This is the man who’s just said that Hurricane Florence is “one of the wettest we’ve ever seen…from the standpoint of water.” Laughing at Trump, or showing that 1970s America isn’t so different from 2018 America, won’t take Trump down. Nor will indulging a script that provokes boredom as much as it provokes laughter. VERDICT: 5/10. BlacKkKlansman had the potential to be something quite special, something revolutionary, in this crazy 2018 that we live in. However, it exchanges subtlety for sledgehammers and rambles on and on until shoving in a bookend that makes the eyes roll. What did you think of BlacKkKlansman (2018) Leave your thoughts/comments below! I was surprisingly compelled by this. Nice review. I’m glad you enjoyed the film!